12:45 Hello everyone and welcome back to AUTOSPORT Live for continuing coverage of the final round in the 2010 FIA Formula 1 world championship - the second Abu Dhabi Grand Prix. The waiting and anticipation is finally over, and the world can now focus on how the four championship protagonists get down to the serious business of gathering tyre and fuel data, as well as finding the best possible balance around the dusty Yas Marina circuit. Red Bull Racing has continued where it left off at Interlagos five days ago, with Sebastian Vettel at the head of the pack after posting the quickest lap in this afternoon's first practice session. The teams will have a further 90 minutes to continue race preparation work and we expect a busy session with the drivers beginning to push a little harder as more rubber goes down on the racing surface. 12:47 A heavy shower shortly before midday had a sizeable effect on what would ultimately be a dull and uninspiring first practice session. But even though the spectators had little to watch for the first 45 minutes, for some teams there was still a lot going on. Red Bull brought another evolution of rear wing to Abu Dhabi as it looks to secure the drivers' championship and the team sent drivers Sebastian Vettel and Mark Webber out with flow-vis paint in evidence to gather data on the performance of the new wing. Force India mechanics, meanwhile, worked quickly and efficiently to change the entire brake set on Tonio Liuzzi's rebuilt car. While that was going on, other teams sent their drivers out to conduct straight-line aerodynamic testing, especially as the F-duct will be a key factor in overall lap time for the final time this weekend. Vitaly Petrov finally got the ball rolling as he began to learn the circuit, but quickly it was the Red Bull and McLaren duo that occupied the top end of the list. Vettel wound up quickest with a lap time of 1m42.760s with Lewis Hamilton second, Jenson Button third, Webber fourth, Robert Kubica fifth and championship leader Fernando Alonso rounding out the top six. 12:49 There have been no further surprises in terms of weather since that rogue shower prior to the start of first practice and conditions remain dry and very warm at Yas Marina. A light southerly breeze at the start of today has backed round to a north-westerly as we go into the second practice session with temperatures slowly beginning to cool down from a maximum of 31 Celsius earlier today. 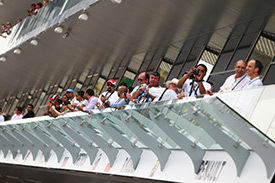 12:51 Motor racing fans love to debate the action on track and the live forum is your opportunity to share your experiences of the Formula 1 weekend with everyone. 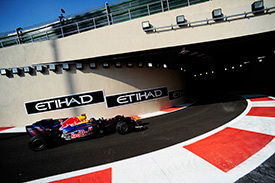 • Will Sebastian Vettel remain on top this evening as the light fades to darkness? • Will Ferrari show its hand in the second session? Alonso was fifth earlier today, but 1.361s down on the benchmark time. • Heikki Kovalainen will take over at the cockpit of car #19 for Lotus following Fairuz Fauzy's outing in first practice. The Malaysian struggled early on with a spin on the damp and drying surface, but eventually managed to put in 18 laps to finish at the bottom of the timesheet with a best time of 1m51.705s. • Toro Rosso drivers Jaime Alguersuari and Sebastien Buemi clocked up the most milage this afternoon, completing 42 laps of the 5.554 km circuit between them. Alguersuari placed 16th with his team-mate 18th. 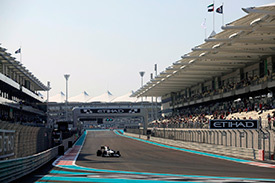 • The final round of the GP2 series takes place this weekend and gives several of the young drivers taking part in next week's Formula 1 test the chance to re-familiarise themselves with the desert circuit. Qualifying took place in the break between sessions and Briton Oliver Turvey claimed a dominant pole position for iSport with 1m48.559s - a time that would have placed him 21st in the first Formula 1 session. 12:55 There are five minutes remaining until the action resumes in Abu Dhabi. 12:56 The track temperature is 31 Celsius as the setting sun casts long shadows across the Yas Marina complex. 12:58 Fernando Alonso walks towards his Ferrari F10 as he looks forward to a positive session this evening. 12:59 Mark Webber adjusts his helmet strap and climbs aboard the Red Bull RB6. 0 min: Di Grassi is the first man out in his Virgin car. 1 min: Christian Klien follows di Grassi through the pitlane tunnel and out onto the circuit. 1 min: Nick Heidfeld joins the early runners in his Sauber. 2 min: Mark Webber heads out to begin his evening's work for Red Bull. Vettel follows him out a few seconds later. 3 min: Barrichello is also on track for Williams as Klien continues to follow di Grassi round on the first timed laps of the session. 3 min: Massa, Hamilton and Button get their evenings underway on the harder tyres. 3 min: Senna, Hulkenberg and Sutil all come out to check over their machinery. 4 min: Di Grassi hussles the Virgin car around the hotel complex and across the line to clock a 1m48.506s. 4 min: Klien follows di Grassi over the line in 1m51.210s as Webber pits after one lap. 4 min: Alonso joins the session in his Ferrari. 4 min: Vettel also brings the Red Bull into the pits at the end of a solitary lap. 5 min: Heidfeld takes over at the top of the early times with a 1m45.314s effort. 5 min: Liuzzi, Schumacher and Buemi all join an increasing group of drivers out for what should be a short run of laps. 6 min: Klien improves to 1m49.436s but remains in third behind Heidfeld and di Grassi. 7 min: Barrichello posts a very sedate 1m53.730s lap and is 10th. 7 min: Hamilton takes over at the top of the order with a first effort of 1m43.292s. Button also joins the times in second quickest. 8 min: Barrichello goes fifth with 1m44.947s but the times are changing rapidly and the Brazilian is already sliding back down the order. 8 min: Alonso starts his evening with the fastest time so far - a 1m42.474s. 9 min: Bruno Senna has been off-road in the HRT but with the vast expanse of asphalt run-off areas he was easily able to rejoin the circuit. 10 min: Michael Schumacher is up to fifth behind Alonso, Button, Hamilton and Heidfeld with a time of 1m43.738s. 11 min: Force India drivers Liuzzi and Sutil simultaneously clock laps within one-tenth of eachother. They slot into eighth and ninth. 12 min: Schumacher finds a full second and crosses the line in 1m42.744s. He moves up to fourth quickest. 13 min: Nico Hulkenberg launches himself up the list with 1m43.303s to put the Williams in eighth. 13 min: Tonio Liuzzi improves by leaps and bounds with 1m42.931s and now sits in sixth, just behind Schumacher who pits after five laps. 14 min: Sutil is on a quicker lap now and let's see if he can match his team-mate ... no - he falls short by almost half-a-second but improves to 10th with 1m43.387s. 16 min: Three timed laps for Schumacher, Rosberg and Alguersuari. They are all back in the pits for set-up changes. 17 min: Alonso leads the pack after a short run with 1m41.473s ahead of Hamilton in second, Massa third, Button fourth and Schumacher fifth. 18 min: Mark Webber is now on track and he goes sixth with a time of 1m42.892s. His team-mate Vettel is on his first timed lap at the moment. 19 min: Vettel goes 15th in the classification and seconds later Webber improves to fifth with 1m42.438s. 22 min: The Red Bull duo continue lapping with Vettel moving just ahead of his team-mate and into fifth with a time of 1m42.367s. 23 min: Webber soon restores the previous Red Bull internal order by grabbing third with a lap of 1m42.082s. 24 min: Button is back on track for his second run as the light continues to fade at Yas Marina. 24 min: Vettel returns to the pits after a run of three timed laps. He is sixth in the standings at the moment. 25 min: Webber completes one more lap and is third behind current pacesetter Alonso and Hamilton. Four timed laps for the Australian and he pits. 26 min: Michael Schumacher is back on track for his second run of the evening. He posts 1m48.228s - more than five seconds off his previous mark. 27 min: Timo Glock leads the new teams' order down in 19th but the German is getting frustrated by heavy traffic on the circuit. 28 min: Schumacher finds some time and improves to seventh with a lap of 1m42.246s. 28 min: Kubica moves his Renault up to third quickest with a lap of 1m41.916s. 29 min: The Musco lighting system is picking up the job of illuminating the circuit now as daylight fades overhead. 30 min: Schumacher pits the Mercedes but was set to improve again. His second run featured just two timed laps. 31 min: Replays now show why Schumacher pitted. He ran wide at the penultimate corner and aborted the run. 33 min: Fernando Alonso heads the list with a time of 1m41.473s with Hamilton second, Kubica third, Webber fourth, Button fifth and Massa in sixth. 34 min: Sebastian Vettel is the one championship contender outside the top six. The German is eighth and is about to come out for a second run. 35 min: The pace of improvement has slowed now with most sets of harder tyres worn past their best. 35 min: Jaime Alguersuari runs wide onto the extra asphalt run-off but keeps his foot in and rejoins without any damage to the Toro Rosso. 37 min: Hamilton sets the fastest first sector as he begins a second run before running wide and spoiling his lap. 38 min: Alonso shaves nine thousandths off the benchmark time with a lap of 1m41.464s. 39 min: Hamilton encounters a slowing Senna at the penultimate corner and only just avoids contact with the HRT. 40 min: Senna then continues to start a timed lap but gives up on the ill-handling HRT and pits, making the earlier inadvertent spoiling of Hamilton's lap seem rather pointless. 41 min: Both Red Bull drivers have been on a run for the last 10 minutes or so, but neither driver has been able to improve thus far. 42 min: But now Webber is up to speed and he moves up to second place with a time of 1m41.550s - just 0.086s down on Alonso's benchmark. 42 min: Vettel also improves and is now fifth on a 1m42.119s. 43 min: The stewards are set to look into that incident between Hamilton and Senna after the session. 44 min: Webber pits the Red Bull to end that run. He completed several timed laps with a noticeable improvement on his final effort. 45 min: Kobayashi improves to 11th quickest with his latest 1m42.768s lap. 46 min: Vettel chips away at his best time and lowers it to 1m41.907s - good enough for fourth. 46 min: So with slight changes to the order it's now Alonso leading the pack with Webber second, Hamilton third and Vettel fourth. 47 min: Vettel jumps ahead of team-mate Webber and into second spot with 1m41.534s. 49 min: Nico Hulkenberg goes for the option tyre and he's now on a super-soft run as Williams looks to evaluate the grippy compound. 50 min: Hulkenberg is currently ninth in the classification with a best time so far of 1m42.449s. 52 min: Barrichello is also on the super-soft tyre and was set to improve slightly until he ran wide at the exit of the final corner. 53 min: Petrov improves to ninth quickest with a 1m42.323s lap. 53 min: Button is on track with super-soft rubber on his McLaren. 54 min: Hamilton is also out to test the softer option tyre. 54 min: Button fails to improve with a 1m48s first lap on his soft tyres. 54 min: Jaime Alguersuari is on a better lap in the Toro Rosso. Like Barrichello earlier, he also registers two personal best sectors before losing it all in the final few corners. He remains in 17th position. 55 min: Sebastien Buemi lost control of the other Toro Rosso under braking for Turn 11 and slid straight onto the extra asphalt run-off area. He was able to continue without damage. 56 min: Hamilton also fails to improve on the softer tyre as he encounters Di Grassi's Virgin in the closing stages of the lap. 56 min: Jaime Alguersuari nails the final sector next time and moves up two places to 15th with a lap of 1m43.309s. 56 min: Petrov finds time after several laps on the soft rubber, moving up to sixth with a 1m42.096s. 57 min: Michael Schumacher is the next man to run out of road at Turn 11. He too uses the get-out-of-jail run-off and rejoins. 57 min: Massa has been for a harmelss spin on the outlap in his Ferarri but is back underway on his soft tyres. 57 min: Alonso is also testing super-softs for the first time today. 57 min: Alguersuari finds another two-tenths of a second with 1m43.128s but he remains in 15th place. 58 min: Mark Webber is back out on the circuit and we wait to see if Red Bull is following suit with a super-soft run. 58 min: Alonso was on course for an improved time but backed off after diving past Kovalainen's Lotus at Turn 16. 59 min: Hamilton tops the times for McLaren with the fastest final sector for a lap of 1m41.213s. 60 min: Jaime Alguersuari has spun at Turn 19 after running wide onto the astroturf. He is just off the track and the incident is being covered with local yellow flags. 60 min: Alguersuari climbs out of the Toro Rosso and his day is over. The marshals work quickly to push the car away and the track is all-clear again. 62 min: With the track now clear of yellow flags, Hamilton sets the fastest first sector and Massa goes quickest through the middle part of the lap. 62 min: With good access to the back of the pits from Turn 19 it is just possible that the Spaniard could get lucky and return to the fray before the end of the session. 63 min: Hamilton finds over three tenths more on his soft tyres to further extend his advantage at the top with a 1m40.888s. 63 min: Mark Webber is out on super-softs as Red Bull plays the game with the other contenders. 64 min: Kubica moves up to fifth quickest as he begins his work on soft tyres with only the four title contenders quicker than the Pole. 64 min: Webber is now third with an improvement of 1m41.369s but on the next lap he pushed a little too hard. He subsequently backs off and may try again in a moment. 65 min: Vettel is also out on super-soft tyres and the Red Bull team will look to gather good data ahead of qualifying and the race. 65 min: Alonso complains of "too much oversteer" to his Ferrari team. 67 min: Massa is also struggling for balance with his Ferrari, suffering understeer as he navigate the 90-degree corners around the Yas Hotel. 67 min: Massa has stopped in his Ferrari approaching Turn 11. 68 min: The Brazilian has pulled to a halt on the second long straight and is stepping out of his car. 69 min: Massa wanders off as the marshals quickly push the Ferrari behind the barriers, leaving the track clear again. 69 min: Vettel continues pounding round on the option tyres with just over 20 minutes remaining in the second session. 70 min: The option tyre is giving good grip over the run and Vettel proves it several laps in with a time of 1m41.145s to go second behind Hamilton. 71 min: Webber is fourth in the classification but meantime Vettel pushes harder on the next lap, setting the fastest first sector time in the process. 72 min: Vettel loses a tenth in the second sector and ultimately isn't able to improve. He remains in second spot. 74 min: Hamilton's 40.237s run through the twisting final sector remains the main source of his current time advantage over his title rivals. 75 min: Radio replays suggest Massa has run out of fuel in his Ferrari. 77 min: Both Red Bull drivers are back in the pits and we have the title contenders filling the top four places with just under 13 minutes to go. 77 min: Hamilton is heading out for the closing high-fuel run in his McLaren. 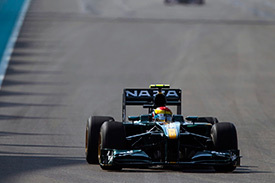 78 min: Hamilton leads the pack with a best lap of 1m40.888s with Vettel second, Alonso third and Webber fourth. They are covered by 0.427s. 79 min: Kubica is best of the rest in fifth for Renault with Massa sixth, Petrov seventh, Button eighth and Liuzzi in ninth spot. 80 min: Alonso makes his own way past Klien's HRT in the final corners as he also gets the customary long run on super-softs underway. 81 min: Webber comes back out to begin what will be his final run of the day. These may be laps in the 1m46s bracket with a good load of fuel aboard. 82 min: Webber stays on the option tyres so that the team can replicate race conditions in the dark on high fuel. 83 min: Webber clocks 1m47.497s on his first timed lap of the final run. Vettel is also now on track. 84 min: It is the customary heavy fuel and soft tyres all round now to close out the last Friday practice session of the year. 87 min: Vettel is on a lap now as he works through race preparation. He manages 1m47.019s - four-tenths quicker than Webber's lap a few moments ago. 87 min: The McLaren pair have been through the pitlane to swap front wings to an alternative configuration before continuing on the late heavy run. 88 min: We can see that Vettel has clear space to work with as the team finds him a good break in the traffic. 89 min: The latest lap between the Red Bull pair proves inconclusive as Webber backs off in the final sector. 89 min: Much closer this time round with one-tenth of a second between the Red Bull duo after two sectors. 14:30 The flag is out to end Friday's action at Yas Marina. 14:31 The gap at the end of the lap between Vettel and Webber was slightly in the Australian's favour by around half-a-second but Vettel was mired in traffic. The pair are closely matched when they get clear track. 14:31 The drivers will again be allowed to practice starts from the grid. 14:32 So Lewis Hamilton ends the first day of action at Yas Island with the fastest time - 1m40.888s ahead of Vettel and Alonso. 14:33 Webber concludes the day in fourth as the championship contenders steal a march on the rest of the pack. 14:35 Kubica is best of the rest in fifth for Renault with Massa sixth, Petrov seventh and Button in eighth spot. 14:36 Tonio Liuzzi puts Force India up the order in ninth and Nico Rosberg rounds out the top 10 with team-mate Schumacher in 11th. 14:42 The story of the day took a little while to develop, but the four title protagonists occupy the top four places on the timesheet. All that does is whet the appetite even more for tomorrow. A slightly reduced and traffic-affected programme of high fuel work at the end of the session means that we can only garner rough detail on the relative race pace between the top four, but things do look close. Saturday's final practice will help further in that aspect plus we have the knockout qualifying session and one-lap banzai pace under the lights to look forward to. It should be a cracking day of action. Join us for all the fun starting with practice three at 09:45 GMT on Saturday.